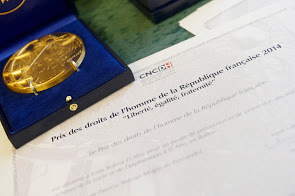 The French Republic honoured SENGSAVANG with the Human Rights Prize for its project focusing on protecting and assisting victims and girls at risk of human trafficking and sexual exploitation in the Lao PDR. The judging panel particularly highlighted the concrete actions implemented by the organisation and the long-term positive impact the project had on the lives of the victims. The SENGSAVANG team is very grateful to be awarded with this prestigious prize in the category of “trafficking and child exploitation”. The Human Rights Prize, which was created in 1988, honours non-governmental organisations working in the field of protection and promotion of human rights, irrespective of nationality or borders, undertaken in France or abroad. Organisations embodying the spirit of the Universal Declaration of Human Rights, and the World Conference on Human Rights are recognised. Every year, only five organisations are commended for their efforts. 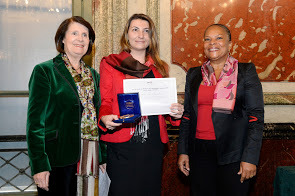 The President of the National Consultative Commission on Human Rights (Mrs Christine Lazerges) together with the French Minister of Justice (Mrs Christiane Taubira) presented SENGSAVANG with the Human Rights Prize at an official ceremony held in Paris on 9th December 2014. “We are extremely attached to this human rights award because it carries a powerful message of value”, said the French Minister of Justice, highlighting the winners of local, national, European and international commitments. “We must ensure that human rights truly come in daily practice and are normalised” advocated the French Minister of Justice before recalling France’s ratification of the 3rd Protocol to the Convention on children’s rights on 4th July 2014, and finally the Istanbul Convention on the prevention and combatting violence against women and domestic violence.